Targus 16" Metro Roller Notebook Bag - 16" Screen Support - Polyester - Black - Welcome to TABS! The closed-cell foam padding keeps your laptop protected while the durable, water-resistant polyester material keeps your belongings dry in wet weather. The front, zip-down workstation includes pen loops, business card holder, zippered pocket, cell phone pocket and large pouch to store additional accessories. The telescoping handle retracts into a zippered compartment when not in use. 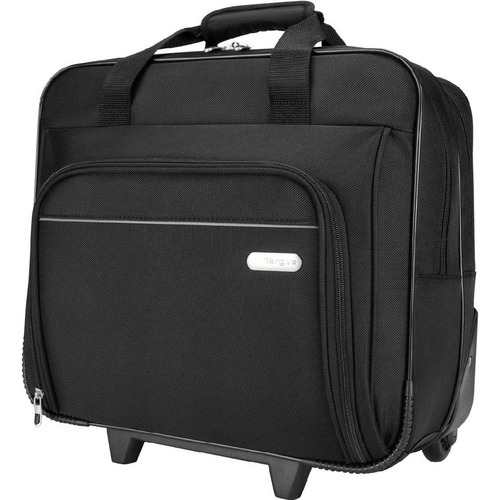 Rolling laptop case protects laptops with up to 16" screens. The closed-cell foam padding keeps your laptop protected while the durable, water-resistant polyester material keeps your belongings dry in wet weather. The front, zip-down workstation includes pen loops, business card holder, zippered pocket, cell phone pocket and large pouch to store additional accessories. Large zippered compartment lets you store office essentials or clothing for overnight trips. The telescoping handle retracts into a zippered compartment when not in use. Case includes a dual carry handle for added convenience. Material: Polyester Poliéster Maximum Screen Size Supported: 16"